Simone Fernando Sacconi began his long and fascinating career at a time when many excellent violin makers were working across Italy. To rise in this competitive environment took talent, stamina and, in his case, being willing to go against the flow. The son of a tailor and amateur violinist, Sacconi was born in Rome on May 30, 1895 and was apprenticed aged 9–16 to Giuseppe Rossi, who himself learned from Eugenio Degani. When Sacconi began learning his trade, the renaissance in violin making was flourishing in northern Italy. Rome, by contrast, had been without a proper school of violin making since the late 18th century and the few makers who did work there during the 19th century lacked a cohesive tradition. Moreover Rome was so removed, culturally as well as geographically, that it would have been most unusual for a Roman to feel the urge to move north and try to fit in with makers such as Bisiach, Antoniazzi and Fagnola. Noteworthy Roman violin makers before Sacconi included Rodolfo Fredi and the Politi clan, headed by Eugenio and his better known and his far more prolific son, Enrico. Vincenzo Sannino, a Neapolitan who had worked in Rome on and off after 1914, and Enrico Politi would become Sacconi’s local competitors. Nevertheless, Sacconi’s talent, intelligence and precocious ability shone through and it wasn’t long before he proved himself the best restorer and violin maker in Rome. Aged 14 he met the violinist Ferenc Vecsey, who owned the 1716 ‘Marechal Berthier’ Stradivari – a fine golden period example which became available for Sacconi to examine in detail. At this point the boy must have understood that his fate would not be to follow in the footsteps of Rossi, but to cultivate the art of precision copying. His true master was to become Antonio Stradivari himself; indeed during his career he demonstrated that it was possible to learn a great deal about classical violin making through astute observation of the great Cremonese instruments. He undertook to copy the ‘Berthier’, reportedly with excellent results. Soon after entering Rome’s Accademia degli Belli Arti, Sacconi’s studies were interrupted by the outbreak of World War I, in which he suffered a slight wound and was decorated. He was back at work around 1918, making a superb copy of a golden period Stradivari cello as a commission from Gaspar Cassado (now owned by Norway’s Dextra Foundation). Although Sacconi was only in his early 20s, this instrument shows the work of a mature craftsman with a profound understanding of Stradivari, not only in his woodworking but also his intuitive grasp of the varnishing process. At about the same time he also copied the ‘Piatti’ Strad cello of 1720 and the ‘Paganini’ viola of 1731. During the 1920s fewer than a dozen Italian makers could compete with Sacconi’s workmanship and intimate knowledge of specific classical Cremonese instruments. His devotion to copying, rather than creating signature models as the Italian tradition dictated, coupled with precise handling of his tools, set him apart from his contemporaries. It also earned him the controversial reputation as the most ‘French’ of the modern Italian violin makers – an interesting point that will be addressed in part 2. 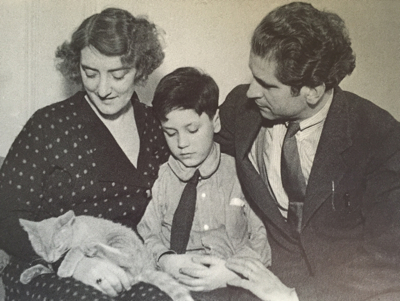 In 1925 Sacconi married Teresita Pacini and the following year their only child, Gaspare, was born. He continued working in Rome until 1931, when Emil Herrmann invited Sacconi to work for him in New York. A number of Italian luthiers emigrated to the Americas due to the hardships and extreme competition experienced in Italy in the first half of the 20th century. Giulio Degani had moved from Venice to work for Wurlitzer, but the quality of his violin making diminished markedly during his years in Cincinnati, Ohio. Jago Peternella was another good Veneto maker working in NY at the time, before moving to California, but he met pretty much the same fate as Degani with his American-made instruments. Around that time American violin making centered on copying Stradivari and Guarneri in the German and French styles and was heavily influenced by the aesthetics of the skilled Carl G. Becker and George Gemünder, a highly regarded Vuillaume pupil. As someone able to execute copies of the two masters with great precision, but also to introduce some much-needed Italian flair, Sacconi was tailor-made for this situation. The move to America proved pivotal for his career: while most of his contemporaries in Italy struggled, Sacconi blossomed in the busy New York environment, where there was a good market for his exceptional skills in restoration, making and, later, teaching. 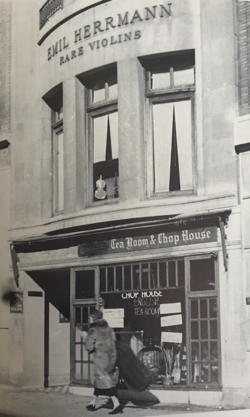 It also set the stage for the development of Herrmann’s violin business. In hiring Sacconi, Herrmann brought in a young, but already knowledgeable and respected restorer and maker, with good contacts back in Europe. Sacconi kept in touch with some of his counterparts in Italy, often returning there throughout the rest of his life. During this period Sacconi made a few new instruments, but for the most part Herrmann kept him busy with restoration and maintenance of the many fine instruments that passed through his hands. Over time Herrmann acquired a reputation for being not the most scrupulous of dealers, and doubtless Sacconi would have been required to play a part in some of the activities that earned him this reputation; perhaps unsurprisingly Sacconi had no particular affection for Herrmann, as is suggested by a letter he wrote to Iginio Sderci in 1948. In 1936 Sacconi began training the very young Dario D’Attili, a fellow Roman, in the Herrmann workshop. The pair were pretty much inseparable thereafter and D’Attili inherited Sacconi’s knowledge of violin making, business management and expertise, though the pupil never equaled his master in any of these fields and it is rumored that their relationship may not have always been as smooth as was generally perceived. When Herrmann retired in 1951, Sacconi was hired by Rembert Wurlitzer, who in 1947 had purchased the violin department of the Wurlitzer firm from his father, Rudolph. Working in collaboration with one of America’s greatest violin experts afforded Sacconi close contact with the hundreds of fine instruments that passed through the shop, and also with the legendary musicians who visited it. Sacconi, who lacked business sense, but more than made up for it in his humanistic and ethical qualities, proved indispensable to Rembert Wurlitzer Co., including in their instrument acquisitions in Italy. He was at the head of nearly all major aspects of the business and was in fact there far longer than Rembert, who died unexpectedly in 1963. During those years Wurlitzer’s became the first center of serious American violin expertise and Sacconi’s pupils in the later years of the firm benefited enormously from this. Many of the violin makers, experts, restorers and dealers of the generation directly following Sacconi’s either worked for Wurlitzer under him or had learned from him in Italy and would proudly refer to their master as Simone Fernando. D’Attili, Harry Duffy, Hans Nebel, Jacques Francais, Rene Morel, Charles Beare, Luiz Bellini, Vahakh Nigogosian, Max Moller, Pierre Vidoudez, Hans Weisshaar and Francesco Bissolotti are just some of these names and this group has had a tremendous influence on the violin trade as a whole. Many loved him, and all had the deepest respect and admiration for him. An inscribed photo given by Sacconi to his colleague Hans Nebel in 1966. After Wurlitzer’s death Sacconi, who was by then in his late 60s, began to spend more time at his modest home at Point Lookout, Long Island, where he could enjoy his favorite hobby – fishing. From there, the two-hour commute into midtown Manhattan became tedious and the atmosphere at Wurlitzer’s became progressively tense before the firm’s final closure in 1974. Meanwhile, he continued making and restoring instruments, and, more importantly, writing his book on Stradivari’s methods, The Secrets of Stradivari, which was to immortalize him. Sacconi also became a pivotal figure in the establishment of the New Cremonese school. With the death of Enrico Ceruti in 1883, Cremona’s fine violin making chain had been irretrievably broken, while the Italian renaissance of the craft at the turn of the 20th century had shifted to the far larger industrial cities, such as Milan, Turin and Bologna. The future of violin making in Cremona remained uncertain for close to 60 years, until the Stradivari Bicentennial Exhibition and violin competition of 1937. Sacconi was one of its principal organizers. A first of its kind and never to be equaled in its sheer scope, the exhibition featured numerous examples by the classical Cremonese makers and no fewer than 300 instruments from over 120 other violin makers. Sacconi himself took part and won a gold medal for his quartet. 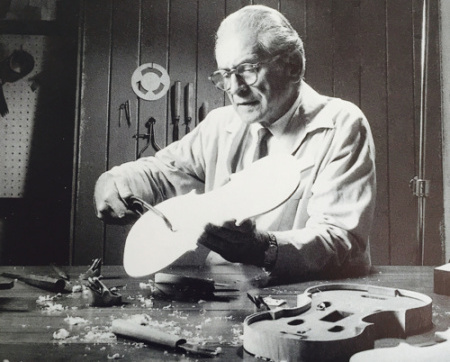 As a direct result of the exhibition’s success the International Violin Making School was established in Cremona and in 1939 Sacconi was asked to become its director. The intention was clear – to position Sacconi at the heart of a crusade to revive the lost Cremonese art. Sacconi, however, refused the invitation, although from 1962–1972 he spent a couple of months a year in Cremona, teaching at the school and acquiring instruments for Wurlitzer’s. He used Bissolotti’s workshop as a base, though it is not clear whether he actually constructed any of his own instruments there. In 1972 he was bestowed honorary citizenship by Cremona’s mayor for his tireless efforts to bring the city’s most important craft back home. Despite the admiration of Sacconi’s many pupils and musician clients, relations with his former competitors in Rome, Politi and Sannino, remained strained, probably due to professional jealousies. At one point during those years Sacconi, acting on behalf of Wurlitzer’s, commissioned Roman violin makers Giuseppe Lucci and Rodolfo Marchini to acquire from Sannino the remainder of that ageing maker’s instruments. 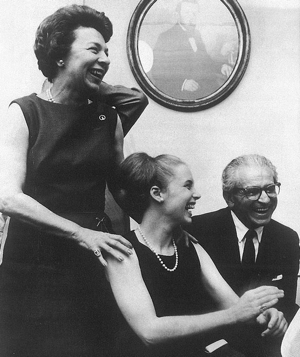 Sacconi died on June 26, 1973 and Rembert Wurlitzer’s widow, Lee, who had directed the business for ten years with the help of Sacconi, wound up the company soon after. Sacconi’s legacy today is truly global. Thanks to his dream of establishing a New Cremonese school, dozens of violin makers are based in Cremona and graduates of the International Violin Making School have spread around the world. All of these practitioners, whether makers or restorers, have been influenced by the teaching of Sacconi. In 2001, a well-known British quartet was named after him, and the Simone Fernando Sacconi Medal is now a coveted prize at Cremona’s Triennale violin competition. Clearly, had Sacconi dedicated less of his time to restoration and supervising the New York workshops, we would now see far more of his instruments, which are unfortunately scarce indeed. But it was this multi-faceted personality that in the end made him a modern legend. His focus and in-depth studies of Stradivari’s working methods led many to believe that he was the greatest violin maker of the 20th century. 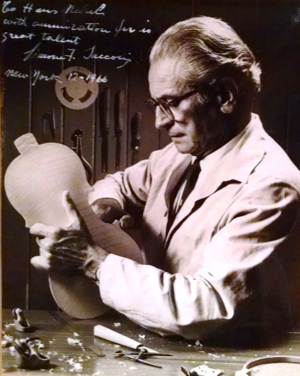 Time will tell whether this is indeed the case, but he was undoubtedly one of the most talented, knowledgeable and dedicated men to have ever laid a hand on a violin and he was certainly the most publicly acknowledged of the modern violin makers, not only during his own lifetime, but also beyond it. Thanks to Gabriel Schaff for supplying photo material. In Part 2 Dmitry Gindin discusses Sacconi’s work.